Mads Brügger is an interesting filmmaker. I was such a big fan of The Red Chapel, his 2010 documentary about North Korea, that it very nearly made my top ten list that year (it was an honorable mention at #12, right under Jacques Rivette's Around a Small Mountain). 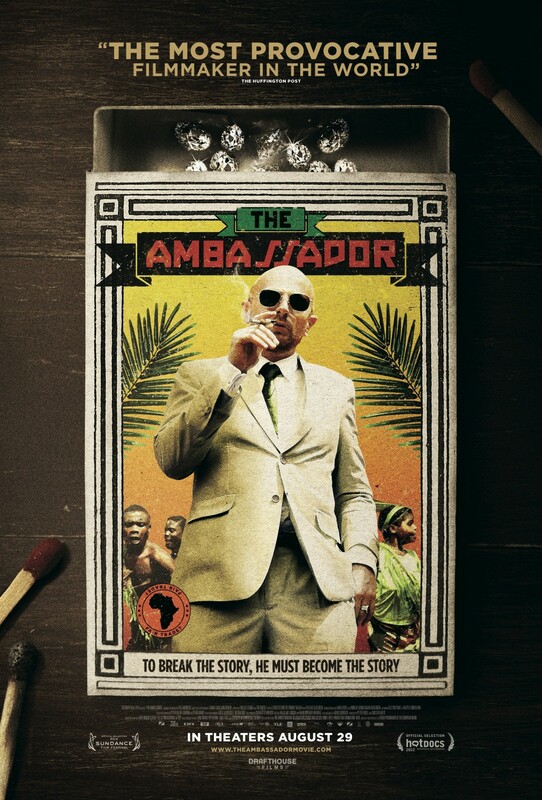 In his latest film, The Ambassador, Brügger turns his focus away from the reclusive nation of North Korea to the arguably even more dangerous Central African Republic, a mostly lawless former French territory that serves as a stomping ground for all sorts of shady types looking to make a killing (literally) in the diamond industry. Armed with authentic Liberian diplomatic credentials (a feat that has landed him in hot water with the Liberian government and President Ellen Johnson-Sirleaf, despite the fact that she signed them herself), Brügger headed down to the CAR to get his hands on some of Africa's infamous blood diamonds. The result is something both fascinating and frustrating; a complex and at times muddled series of back room deals and suspicious characters who rarely if ever know they are under the ever watchful eye of Brügger's cameras. 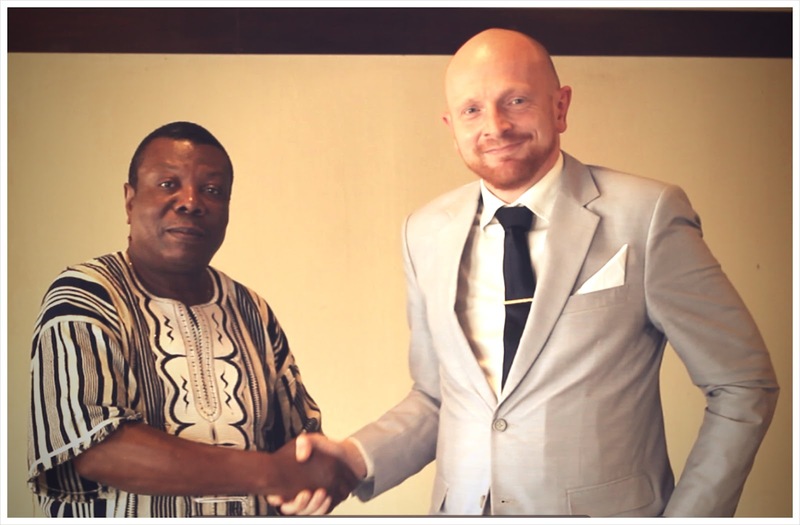 Mr. Cortzen is appointed ambassador by Liberia's Foreign Minister, Toga McIntosh. Posing as a Danish businessman looking to open a match factory, Brügger cons government officials into believing he is a legitimate businessman while convincing the corrupt that he is just as up to no good as they are. But it soon appears he may be in over his head when contacts he has made along the way begin dying. Thrust into the middle of the cutthroat world of African diamond trade and government corruption, Brügger may have just stumbled upon his most dangerous venture yet. The biggest problem with all of this is that while Brügger may be exposing rampant corruption and underhanded dealings, he is also engaging in those behaviors himself. The project, which was funded by the Danish Film Institute, actually funneled money to crooks by paying out millions to purchase Brügger's diplomatic credentials while lining the pockets of corrupt officials with "envelopes of happiness" filled with money in order to procure the diamonds. While Brügger ended up selling the diamonds and donating all the proceeds to the Pygmy village to whom he promised employment in his nonexistent match factory, it's nearly impossible not to wince when you think about where the money he had previously spent actually ended up. One can't help but wonder, though, what exactly it is that Brügger is trying to say? If his goal is to expose corruption, then he clearly does. But's a long and complicated road to get there. The Ambassador is filled with so many back room deals and a revolving door cast of characters that it's hard to keep up with who is what to whom and where they're from and what they do. It's a much less funny film than The Red Chapel, but no less subversive. However here the problem is that Brügger's goal isn't quite as clear. You have to respect him as a filmmaker. He's clearly a fearless (and, one could argue, reckless) muckracker with bigger cajones than Michael Moore could ever hope to have. But The Ambassador is in bad need of streamlining. Sure the covert nature of the filming doesn't exactly lend itself to a cohesive flow, but Brügger's construction doesn't help the already convoluted message surrounding his outlandish stunt. What is clear is that the Central African Republic is a dangerous place, and that many loopholes exist for unscrupulous Westerners to exploit the unstable remnants of post-colonial Africa. Already Liberia has set about trying to close some of those loopholes (while pursuing "hey you're missing the point" legal action against Brügger) so the film has clearly had an effect. But at what cost? They say the road to hell is paved with good intentions. And in this case you have to wonder just which road Brügger is on. 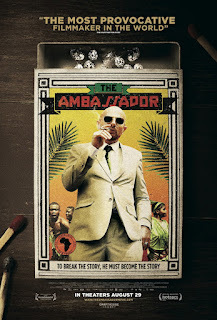 THE AMBASSADOR | Directed by Mads Brügger | Not rated | Opens Wednesday, August 29, in NYC. Friday, August 31st, in Los Angeles. Review | "Celeste and Jesse Forever"
"My Parents Are Crazier Than Yours"
Review | "The Odd Life of Timothy Green"
Review | "Neil Young Journeys"